Wellington Road: Anarchy at the playcentre: another chronicle in mummy politics. Anarchy at the playcentre: another chronicle in mummy politics. Our playcentre (the child's cooperative preschool) was unusual in the national organization. For a few years, we had no president. It was anarchy. Having no president suited me well. I liked that nobody was in charge. The buck stopped with all of us. During my three years at the centre, it grew from eight families to its current almost 30 families. We bucked the earlier trend of sending four-year-olds to kindy (Kiwi for traditional preschool). Instead, we kept our four-year-olds at the playcentre, and we healed our centre from near death to a robust, healthy centre. And Tuesday night, we "elected" our new officers. Thankfully, there was wine. In a surprising coup, two of our members nominated themselves as co-presidents. Because last year, they didn't know what to do with the mail addressed to the president. At the meeting, a couple of aristocratic members said that they wanted a president. The rest of the group blinked like a bunch of sheep, and said they didn’t know what they should do. I was the only dissenting voice. According to our new co-presidents, the centre's "consensus" was in favour of their coup. My feathers are still ruffled. Why can't we all be presidents? A few people (who will be stuck at the centre longer than me) think they made a mistake. Um, yeah, ya think? Al Gore after losing the election to Dubya. Helen Clark standing down as Labour leader. Edited to add: Okay, so maybe this post was a bit whingy. If you are here for sunshine and light, you are in the wrong place. Yah, and you know why they want a president too, so they can be it and be in power. I have heard equal parts good things and bad things about playcentres and the bad is always to do with the politics. I like the sound of your old organisation and the photo of Helen gave my heart a pang. Why Helen, why?! Politics seem to bring out the worst in people. I still feel that Gore was robbed and the fact that Dubya was re-elected just blows my mind. I just hope your new presidents don't use the word nuclear (pronounced of course as nuke-u-ler) and even if they did that would be odd for a playcentre. Basically what I'm trying to say is, keep your eye on them. I think you should organise a military coup. Or at the very least, stick your tongue out behind their backs. Omega, I think that is one of the things that irritates me the most--that no one at our centre has managed to finish their course training. That, and not enough appreciation for the contributions of the old guard! Let's hope all that power does not corrupt absolutely. 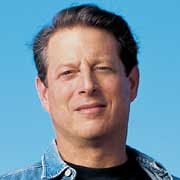 Al Gore looks remarkably sanguine in that picture. Maybe he was relieved? Perhaps your co-presidents will understand why in a few months. I wasn't happy with how the meeting was conducted, or the outcome. But I think it's great our new co-presidents have volunteered their time. I wish them well. A right turn in ghastly weather. I'm thankful I don't have to eat turkey. I did not get permission to write this post.